What the blazes is going on with the Tory-DUP £1 billion deal? All smiles, back in the summer – but how long will the pleasantness last? 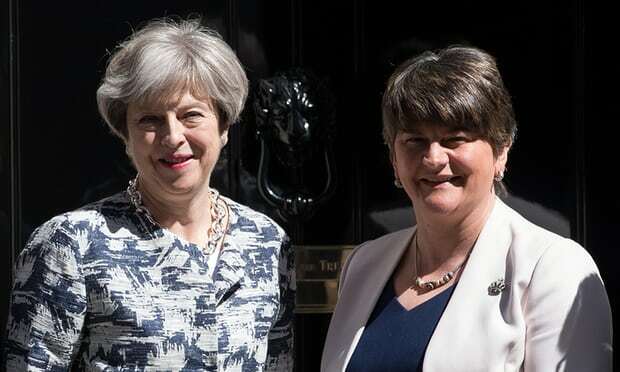 Theresa May (left) with Arlene Foster, the leader of the DUP [Image: Carl Court/Getty Images]. A crowdfunded bid at the high court in London to challenge the government’s controversial parliamentary deal with the Democratic Unionist party has failed. Two judges rejected an application made on Thursday by Ciaran McClean, an unsuccessful Westminster candidate for the Green party in Northern Ireland in the general election, to bring a judicial review of the legality of the £1bn deal. The claim alleged the deal breached the landmark 1998 Good Friday agreement and the Bribery Act. McClean, who raised tens of thousands of pounds for the legal action via crowdfunding, accused the government of “buying DUP votes” to hold on to power. London will hold back the £1bn promised by Theresa May to the Democratic Unionist party as it moves to impose a budget on Northern Ireland, with hopes fading for a deal to restore the region’s government. After months of fruitless talks at Stormont, near Belfast, a deepening schism over the Irish language has dimmed the prospect of a breakthrough in talks between the DUP and Sinn Féin. The “confidence and supply” deal agreed between the DUP and Mrs May’s Conservatives remains intact in Westminster. However, the £1bn of funding will only be released only if a power-sharing executive is restored or London imposes full-blown direct rule. If a legal matter cannot be examined in a court of law, then where can it take place? And if no deal can be hammered out to restore devolved government in Northern Ireland, how will the DUP feel about losing the £1 billion for which they sold their souls to the Tories? The Establishment looks after its own, …yet again. the UK judicial system reeks the same as that in the US where the Elite look after their own all the way.